When I was organizing my decorating book collection on the new bookshelf in my office, something struck me. Most of the books were written by people who I now consider friends and professional acquaintances. When I was first joining decorating book clubs 18+ years ago to start and grow a collection, I never would’ve guessed that. And today, I am celebrating adding another book written by a friend to my shelf. Melissa Michaels of The Inspired Room is launching her new book, Dwelling, this week. In full transparency, I haven’t had a chance to read it from cover to cover, but I took some time and hopped around to each chapter to do some skimming and quick reading. What I love about this book is I was able to do that and still walk away with some encouragement and great ideas. What I also like about this book is it focuses on what the home is all about. Your home and the stuff that’s in it is there to serve you, your family, and, by extension, your guests. If it’s not doing that, if it’s frustrating and stressful, it’s not serving its purpose. Your home is not there to get likes on Instagram or to be magazine-worthy. It’s not there to show off how much you have or don’t have. It’s not simply a place to protect you from the elements. It should serve you and, as Melissa puts it, it should nurture and inspire you and your family. As her books always do, this one had me looking at my own house and thinking through my approach to certain rooms. It’s obvious to me to make the studio a place that nurtures and inspires. It has to be conducive to creativity or it wouldn’t be a very good studio. But what about other rooms in the house? I confess that sometimes I make choices based on what will look good or be photogenic or just what is my personal preference and I’m not necessarily looking at the big picture of wellness in our home and how each room can help or hinder that. And what about the boy’s rooms? I haven’t even gotten around to painting them, yet, and it seems like a low priority when trash and dirty clothes are left all over the floor. Would they even care if the walls were painted? I think that’s the wrong question. The right one might be, Would painting the walls make their room a place that nurtures and inspires them? Maybe it would inspire them to put the trash and clothes in their proper place at least. Kidding, but I’m thinking I should make painting their rooms a summer project. I bet Dwelling will have you thinking about your own home and ways you can design it to nurture and inspire your family. In order to celebrate this book launch, Melissa is offering up a copy of the book along with some home and self-care products she loves. Details on the giveaway and how to enter are below. Disclosure: This is not a paid sponsored post, but I did receive a complimentary copy of the book. This post contains affiliate links. How we all need more simplicity direction and serenity! I love that people are becoming more aware of the influence of our home environment has on our overall well being. Books like this are thought provoking and motivational. I’m always trying to improve our home environment so I’ll be getting this book to help me along. Thanks for posting about it and how it made you think! My struggle with creating a space that nurtures and inspires my family is that we are in a tiny apartment that just frustrates the heck out of me. We moved into it last August after our cross-country move and I sit on the couch staring at everything and don’t know what to do to make it work better for my family or make I feel more like a cozy gone that serves my family well. I am loving working through Melissa’s book and hoping it will help change my attitude towards our current home. I’m looking forward to reading this book-so far I’ve only done a very quick flip through. I do want our home to be a place that my family enjoys being in, a safe place where they can be themselves, relax and be at home. My husband and I bought a home six months ago and he passed away three weeks ago after 22 years of marriage. I always decorated with his “manliness” in mind and was fine with putting small splashes of my personality here and there. Being inspired to create my new future is not easy but necessary for my own contentment. I want to live intentionally and would love to have a kick-start with these products. Who knows, maybe I’ll find my inner creativity again! Would love to read this book! Getting ready to purchase a new home. Thank you. I like the ‘dwell well’ philosophy. I moved into a 600 SF cabin on 5 acres and have eliminated so much unneeded stuff. I now have all the things I love and that give me joy. I also spend more time doing what I enjoy-being outdoors, growing lavender and a garden. Cut back on work and have no debt. In the winter it is so cozy and peaceful. I am enjoying the dwell well philosophy. The book sounds right up my ………country road. I’m always trying to instill peace in my home. Sounds like a great book to read. I’m looking to discover how to create the home that works for me and my dogs at this stage in my life (empty nester) so it feels like a home even though it’s no longer populated with so many people. I’d love to read this book since Marion thinks we all should! I would love to read this new book . 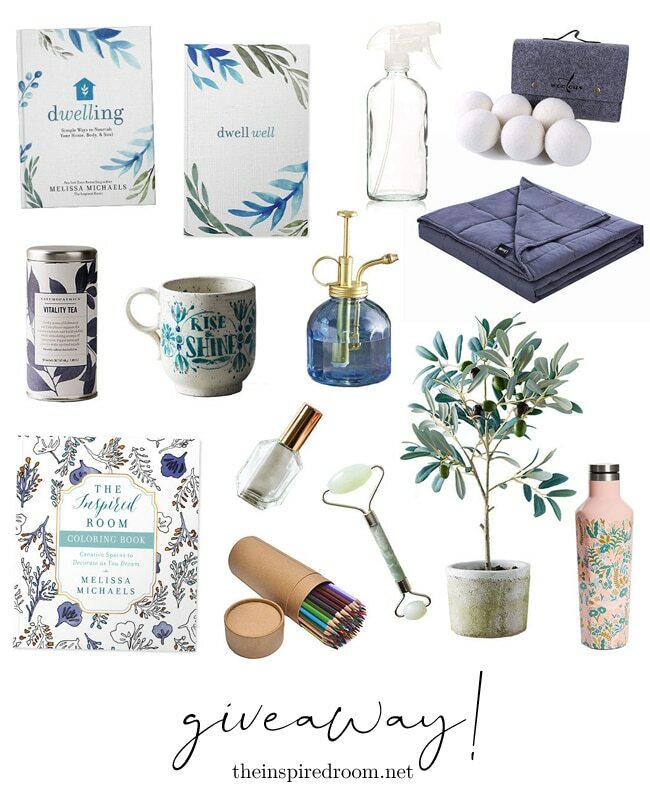 The giveaway has a lot of great things that I would love to win that would inspire me to work on my home environment. Dwelling sounds like just what I need to read. As empty nesters we are refreshing our home but want it to still be a place the kids want to come home to. Simplicity is definitely what I strive for. Thank you for sharing. I received my copy of the book this week and am loving it so far. It is what I needed at this stage in my life and I am looking forward to using her suggestions to create a serene home that offers comfort from the many stresses in life and a welcoming environment to family and friends. I love Melissa’s philosophy of making our homes nurturing spaces and loving our homes even if they are not perfect. I can’t wait to read this book. I am definitely a homebody and love being home but sometimes become overwhelmed with all I need to do to keep it clean and tidy. Hope this helps. with my recent injury i have come to the realization my home needs to be my sanctuary. with 6 animals it can be chaotic at times and the de-cluttering can not include pet toys dang it…. with my daughter of 27 moving back in with us in June my guest room is top priority but since she will bring her “stuff” with her not much other than fresh paint is needed and maybe a mirror and new floor. LOL it never ends does it??? We’ve spent the past 18 months remodeling an old house to use as a business. As a result, our home has been at the bottom of the priority list, and it shows. It’s time to finish the half-painted rooms and declutter the stuff that has accumulated in that time. After struggling for years to find peace and balance, I have come to realize the closer my relationship is with Christ, the easier that peace and balance is to find! What a lovely way to explain how to make a home, not just live in a house. Yours is a very inspiring group. Thank you! I have her first book and it is beautiful. Your home should be a safe and peaceful place for all who enter. It looks like a great book. We are looking to downsize and move permanently to our lake house. The book would be helpful. How would I create more health and peace? Tough question because I’m anywhere but there right now. The best, most obvious answer is to rest in Christ. I have to work harder on that. Looking to simplify our home so I can have peace from clutter and less cleaning! I know that there is too much clutter in our house, and it affects the way we feel. I’m also learning that stuff that I love, will not necessarily be the things my children will want one day. I want to be more thoughtful about what we actually need in our home to make us all happy!!! Thanks for sharing this book with us. I need some focused direction concerning my home. Your house is amazing! I added your blog to my favorites. You are so talented. I wish I knew how to paint. I will be perusing you blog for inspiration and ideas. Thanks for opening up your home..
Would love to read her book and get some ideas on being more intentional when decorating my home. will have to read this book as Melissa makes a good point. Thanks for sharing this Marion. Hi Marian, As always you have a thoughtful take away. Thank you for the daily inspiration! I am so looking forward to reading this book! Thanks for sharing! Inspired to create a healthy environment in my home. About 3 months ago, I moved into my first house. I tend to look at Instagram and Pinterest too much and do things that others do instead of doing things that make my house a home for me. I am happy with my choices but I want to try to be more intentional about picking things that are what I like and not what is popular. Also, I still have stuff to unpack and put away. I want to work on getting it done. It’ll give me more peace knowing it’s done. Ordered the book and am looking forward to reading it. I need to live my life with more intention, focusing on self-care but also making my home a place to feel peace and joy. I am in the process of de-cluttering and the book will inspire me to simplify our home. Thank you for the offer. Currently my husband and I are doing some updating on our home. The reason being is that we want to down size and create a home that is simpler so that we can enjoy the upcoming seasons in our lives. We will soo. Be empty nesters and look forward to enjoying each other and a simpler life without so much upkeep. This book sounds so inspiring. This is the Spring when I’m going to declutter a set of cabinets with items I don’t even know I have!!! Making my “Dwelling” feel even more peaceful and uncomplicated is my goal and getting rid of these hidden items has been on my mind for a long time…time to “git-er-done”!! This book, whether I win it or not, is one that I definitely will purchase and pass along to my daughters for their homes/lives!! Thank you, thank you for this opportunity!!! Looking forward to reading the book since my husband and I are in the process of looking for a home. I am working on cleaning out and paring down. More inspiration is always needed! I agree that our homes should serve us. What good is it to have furniture that we don’t use so that it “stays nice” or just “looks pretty?” The home is for the family for sure. This sounds like a good book. I want to read this. I am beginning a new season in my life as I just lost my husband. I am entering into a whole new phase of life with no husband or children at home. I can begin to think of how I will dwell in my home alone. Thank you for the opportunity. Oh what a delightful topic!! Who among us wouldn’t want to warm up the welcoming of our homes? Thanks for the giveaway!! I have had multiple family deaths in the past 3 years and have new stuff. I need to go through everything and prioritize to simplify my life. It is making me overwhelmed and I don’t know where anything is…. LIfe is so hectic and we are all pulled in a thousand directions. I’m working towards serenity and simplicity in my house! I want it to be a place where the family wants to spend time together relaxing. I’m excited about reading this book!! A perfect addition to my own inspired home! I need to work on making things in my home easier. I live design books – this one looks amazing! We have just married off the last of our six children and are trying to clear out years and years of everyone’s collections. Some of them take their stuff willingly and others like to store it where its always been! We are trying to make our house less stressful with our own collections too and I am loving the freedom it brings. This book seems like it is directly in line with my thoughts! It is so important to me that friends and friends-to-be who come to my home immediately feel comfortable. I want them to feel like they can make themselves a cup of coffee or grab that pretty throw on the sofa and throw it across their legs if they’re chilly. I used to think I had to have everything completely done before others could come over, but am now realizing how important it is to just embrace the journey and invite others along. I love the idea of dwelling and am reminded mostly of Phil. 4:8 where we are reminded to let our minds dwell on things that are true, honorable, right, pure, lovely, excellent and praiseworthy. That’s a great place to start! I can’t wait to read this book. Would love to win the prize!!! Good health at my age revels in organic foods, listening to music, and prayers. I would like to organize my space, drink more water, write down feeling more, maybe stretch daily. Decluttering is my goad for making my home a healthier and more peaceful place. Hoping to read Melissa’s new book. I should try to get rid of so much of my stuff that I haven’t used for years! This would create more peace in my life — not too mention space. Thank you for a chance to win! I am striving for more peace in my home by not worrying how others are decorating, but using colors, pieces and styles that bring me joy! Thank you for the opportunity to win this beautiful book! btw the way you had me when I saw the beautiful watercolored lettered inspirational quotes. Hoping to bring more much-needed peace into my life and home ! I truly need to get rid of excess in my home. I work full time and have a senior this year. Seems there is no time to get everything done. It would be easier to keep things cleaned and picked up with less clutter. This is my goal for the next few months. I would like to help my teens create spaces that nurture them. Thanks for a great giveaway! Goodness – I have been thinking the same thing about my son’s room – aka the disaster! I do need to focus more on making it a restful and encouraging place to be rather than just looking good! Thanks for the inspiration! I am making curtains for my sons room. Then I am refinishing an old desk for him. Thank you for the great giveaway. Thank you so much for this very generous give away. So excited for so many wonderful items. PLEASE, pick me! I love that question? How does my home nurture and inspire me? I would love to win this and read more! Our homes should be a grounding refuge from the earliest age. A secure place where we can grow, create, share, and love so when we do go out into the world we can be a positive influence. Having this refuge, however humble restores us for the next day. Thanks for your inspiring blog! I’m looking forward to reading this book. I find that I need to have a clean and tidy home to have peace. This book looks so beautiful and inspiring, like our homes should be to us. Not to others, or HGTV, or Pinterest, or to “the next buyer” but for us. I don’t even know where to start…I need help!! lol Maybe this prize package would be a starting point!! I love Melissa and her books! Thank you for a chance at the giveaway. Oh how I need to pretty up a space in my home to retreat to. Someplace inviting where I can think, create and craft! I would clear out the clutter and add more plants! This definitely sounds like a book I need to read! So inspiring, thanks for sharing! As a military family ourselves, every home requires reassessing how we will dwell here. Especially as I share this home with 4 teenage boys and my husband. I thought toddlers were hard on furniture! What a fun book, and a good message!! I’m a huge fan of your website and decorating style, I just became the proud owner of Eulalie for my 53rd birthday!! !